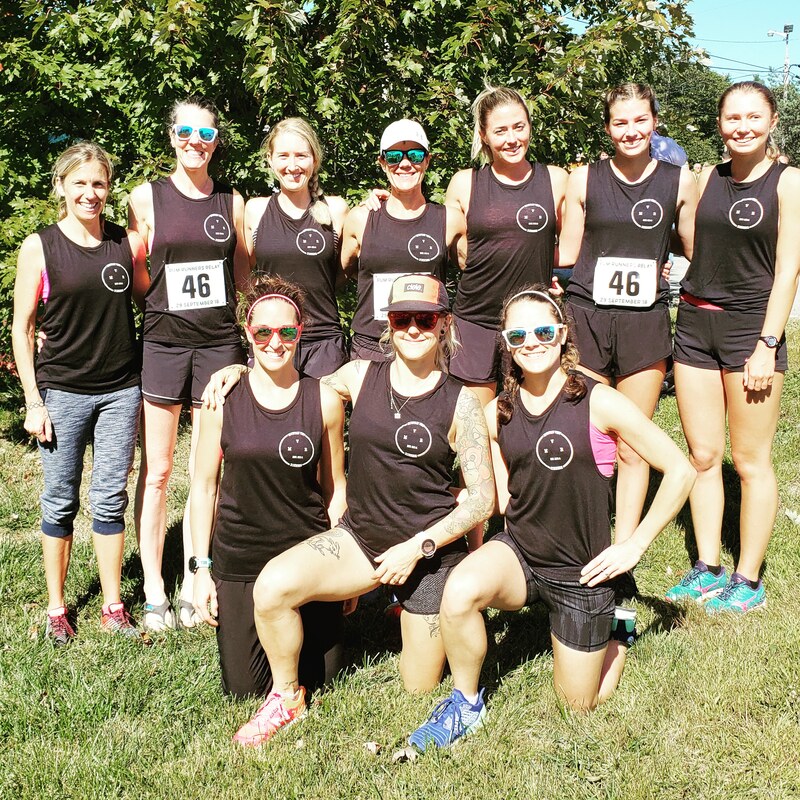 This weekend I was part of an all-female team at the Rum Runners Relay which is a 10 stage running relay that starts in Halifax and winds along Nova Scotia’s South Shore to Lunenburg. The relay is an annual event, first started in 1985, that occurs on the last Saturday in September with 70 teams enter each year, usually with 10 members per team. Our team was named “Mountain View RunHERS” and we represented a broad range of runHERS. From teens that have only started to discover their long-term talent to gals running their fastest times ever and finally to those just hanging on after 30 years racing (okay that last part was biased and describes ME). 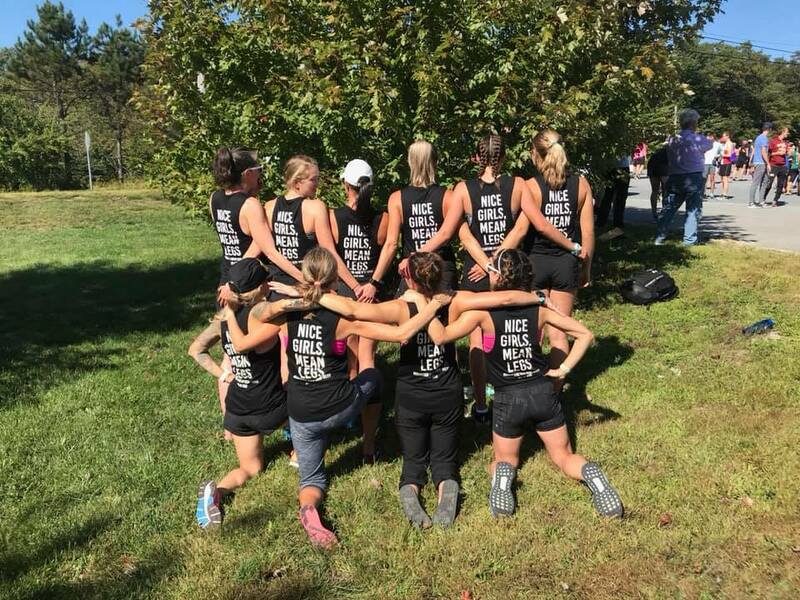 Our team captain made team shirts that said: “Nice Girls. Mean Legs.” And the nice part couldn’t have been truer about my teammates (more on that below). We are a Very Active, Supportive and Canada wide group of Runners. Our name says “Mountain” View Runners, However that Mountain means more than the Literal meaning … We all have our Mountains to climb, be it setbacks, depression, addictions… keep your Mountain in clear view and together, we will help each other over that Mountain…. Come join us…. And you may recall them for the support and encouragement that they provided Sole Sisters Women’s Race as “HILL HELPERS”? They were the folks that ran up and down Creighton Avenue with our participants encouraging and laughing and showing you could get up that hill. And MVR members were on a team of pace rabbits at our last Quarter & Half Marathon and will be back in 2019 (yep, they’ve already told me). One thing I love about MVR is that they don’t require exclusivity. I would have joined them sooner but I hadn’t realized that. After all, I’ll always be a Sole Sister first and foremost but I am also proudly a member of MVR. Looking to join a group, you should check them out. Saturday’s all female team comprised of Mountain View Runners was so empowering for me as a participant. I work very hard throughout the year to create the best training and racing experience that I can for all Sole Sisters. But, as Race Director, I am the organizer. I am not the participant. I really love when women support one another for big goals and it was fun to be on the other side. As the 8th leg of a 10 leg race, I wanted to run well for the team. If it had been a race just for me I wouldn’t have cared as much. But, this was for 9 other gals that I admired as very good runners. As it turns out I didn’t run my best. [I just felt bad from the first mile and with each mile, I felt worse. Nauseous, hot, then cold, a bit spacey and just generally off. I even feared a DNF (“did not finish”) but I gutted it out as I couldn’t let my team down. A DNF for me would have DQ’d (“disqualified”) the team and that was NOT happening on my leg. But 8 miles have never felt so long. I was really unhappy with my run and confused by it. Upon finishing I feared that I had let the team down by not running faster. I’ve had a lot of really solid races this summer and felt confident that I’d have another good run at the relay. Bad wasn’t even on my radar as a possibility. And even if looking at my splits later and you think I had a good time, I can tell you it was bad because it felt bad. The whole time it felt bad. I’ve never hated seeing so many cameras on a course. 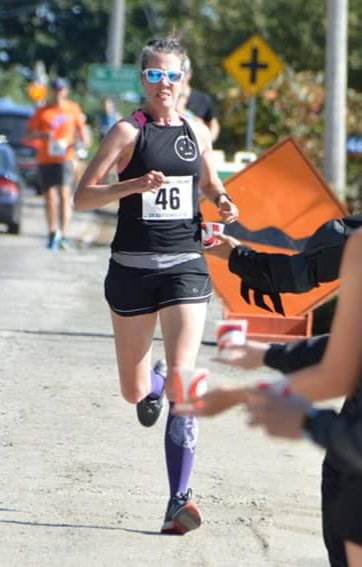 My default is to smile if I see a camera (and studies show smiling helps you even if you feel bad, ever notice that Eliud Kipchoge smiles a lot?) but I had to work hard to muster the energy for even a grimace of a smile. So I felt responsible for hurting the team’s score as I would have added many more minutes to our overall time than I expected to add. I kept apologizing to my teammates who weren’t hearing any of it. They were happy with my run. They saw I was out there giving ‘er and they made sure I knew they were happy with it. I even got a pep talk from the captain as I drove back to the city for a prior engagement. They lifted me up when I felt so down. See that is the best part of a team. You want to do your best for them. Usually, you can get a better performance for a team effort if you are wired like I am. But, if the wheels fall off and you have your worst race? They can make sure you don’t sulk or worry too much. They praise you for doing your best in the moment. And you believe them because you respect them so much as runHERS and teammates. I left the relay on a high from having been with such a fun, supportive and let’s call a spade a spade… FAST relay team. Some of the girls on my team I only knew by their recent race performances and they are incredibly talented. I told my husband as we drove down to the relay how honored I felt to be included in this group of women. And I told him as we drove back how much I loved this team. I wasn’t able to stay for the end of the relay as I had a prior commitment but imagine my excitement when I learned we came in second place female team. There may have been a team faster than us, but I don’t believe for a second that they are nicer or have meaner legs!